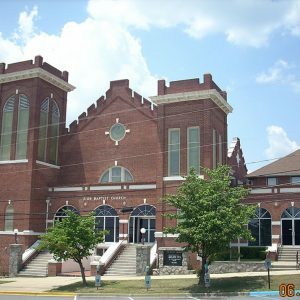 Zion Baptist Church first organized in 1865 and met in a humble dwelling on Gadsden St. The congregation moved to this site in 1871. The current sanctuary, the second on this spot, was built in 1916. In 1930 Dr. Matilda Evans, the first African American woman to have a practice in the state, started a free clinic in the basement of the church. On March 2, 1961 more than 200 African American students met at Zion Baptist before their march to the State House to protest racial segregation. The U.S. Supreme Court later overturned the convictions of those students arrested during the march.